They are the best team, the atmosphere is very nice and they are very friendly, and the best thing is thatthey give you all the help possible. They are the best team, the atmosphere is very nice and they are very friendly, and the best thing is that they give you all the help possible. Always an excellent experience at Dr. Sharobiem’s office - my entire family feels like the dr. and his entire staff, Crystal,Jasmine, etc. treat us all like family! Always an excellent experience at Dr. Sharobiem’s office - my entire family feels like the dr. and his entire staff, Crystal, Jasmine, etc. treat us all like family! Dr. Andro Sharobiem is a compassionate, insightful internist and primary care doctor treating patients in Riverside, California, and the surrounding communities. His primary goal as a practitioner is to ensure that each of his patients feels respected, empowered, and confident in their medical care. 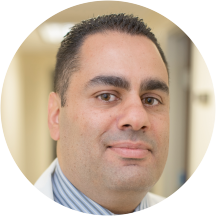 Dr. Sharobiem holds certification from the American Board of Internal Medicine and is a member of professional organizations including the American Medical Association, the Association of Clinicians for the Underserved, and the California Chapter of the American College of Physicians. Originally from California, Dr. Sharobiem attended the Ross University School of Medicine in order to pursue his medical degree. He continued his medical education at the Los Angeles County + University of Southern California Medical Center. Here, he completed an internship program and received his residency training in internal medicine. Dr. Sharobiem is now affiliated with facilities including the Corona Regional Medical Center and Riverside Community Hospital. Patients visiting Dr. Sharobiem can receive a full range of medical services. He provides annual physical examinations, disease screenings, prescriptions and refills, checkups prior to travel and surgery, and certified medical examinations for commercial drivers and athletes. Treatment is available for issues including allergic cough, sore throat, sinus problems, high blood pressure, and ear infection. When he is not treating patients, Dr. Sharobiem enjoys fishing, playing basketball, and spending time with his family. Chair of Department of Medicine, Riverside Community Hospital. Adjunct Instructor of Internal Medicine, Touro University of Osteopathic Medicine. “Intern of the Year”: LAC-USC Medical Center. 2001-2005	Dean’s Highest Honors, Ross University School of Medicine. Nurse Practitioner Rhonda McGaughran was amazing. She was kind, patient, showed concern, and asked all the right questions. She made me feel comfortable. Overall, I had a great experience with the office. Dr. sharobiem, Jasmine, the front office staff, everyone involved in the practice are the most amazing people our family has ever encountered. If you are looking for the best in medical care, call his office!! Kind, compassionate doctor and staff! Best doctor and our family all love him!! I'm bless to have found a health care provider that is professional, knowable and caring. I felt good about the staff here, they are friendly and not too stand offish. I would definitely come back in the future. Great healthcare provider. Addressed all my health concerns. Dr. Andro Sharobiem took the necesarry time to hear my health concerns. Dr. Sharobiem is the most kind and amazing doctor a family could possibly have. We love the staff here as well!!! Professional, friendly and kind. Took the time to examine me and heard my concern. Great doctor, helped me with my arthritis pain and gave me the right medication to counter the pain. He’s the best doctor in SoCal by far and his staff is awesome!! Love Dr. Sharobiem and Jasmine too!! I am pleased with my experience with the Dr. Andro Sharobiem as well as with the employees. The Office is spectacular , easy to find and easy to park. He is kind compasssionafe and amazing as is his staff!! Dr. Sharobiem was great! He was very thorough, professional, and immediately put us at ease. Great! Professional and listens to you. Best doctor and staff ever!! Love them!! Dr. Sharobiem is a good dude. He is always respectful, polite and honest. Best doctor and staff in SoCal!! Kind and professional staff - - best doctor in SoCal period!! I really liked Dr. Sharobien. He has a very professional manner while maintaining a high level of concern for problems and trying to solve them. I was pleased with Ronda, his assistant as well. Good as always. He listens to me, about any health issues. He was genuine, sincere, knowledgeable, and made me feel at ease about my concerns. His staff is great, and he seems to run a great medical practice. He is very genuine in his concern and care for his patients. Dr. Sharobiem always listens to you and recommends any treatment, medicine or recommends a specialist when needed.???? I love my doctor and his staff! He's a real family doctor!! This doctor and his entire staff are a 10 plus! They set the bar for what a family physician should be!! Love Dr. Sharobiem!!! Dr. Sharobiem listens. Very knowledgeable and insightful. Great primary physician. He was great. Seemed like he really cared about how I was feeling. We were on the same page with my treatment plan. My husband and I both think Dr. Sharobiem and his entire staff are second to none! Compassionate, kind, professional and the best doctor in So Cal for sure! Dr Sharobiem partners with his patients in healthcare decisions ... We (patients) have a voice and options. Wouldn't think of entrusting my healthcare to another provider. He is the BEST!! And so is his office staff! He's the most amazing and compassionate doctor and his staff is amazing as well! Another medical professional recommended Dr. Sharobiem and I was very pleased with the first visit. he is friendly, considerate, accessible, and not at all rushed, which means a lot to me as an older person with a fairly long list of concerns. Looking forward to working with him! They are simple the best!!! He's awesome all the way around! Very polite, listens and knowledgeable! He's kind, compassionate and very professional. Dr. Sharobiem listens and explains things so that they make sense. He is patient and goes over everything.